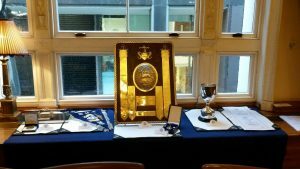 On Tuesday 29th of January the first Doggett’s Emblem and Rowing Awards Dinner was held at Watermen’s Hall. 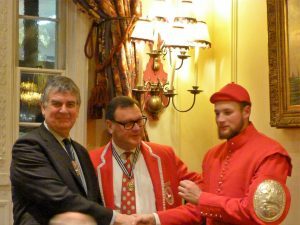 At this very well attended event the presentations were made by The Master, Dr Iain Reid and the Prime Warden of the FIshmongers’ Company, Mr David Robinson. Mr Robinson presented the Doggett’s medal to the runner up Mr George McCarthy. The Master presented the Doggett’s silver pins to the 2018 winner Mr Alfie Anderson. and Mr George McCarthy. 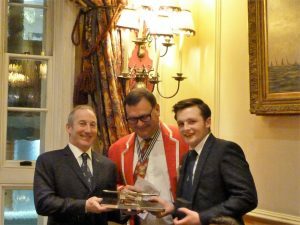 The George Saunders 1959 Doggett’s winner Cup was awarded to the most improved apprentice at the 2018 Henley Sculling Weekend , James Berry. Certificates to those attending the Henley Sculling Weekend went to Joe McCarthy, Mathew Brookes, Sam Miles, Thomas Costin, Billy Welsh, James Berry, Jimmy Anderson and Lucas Ansbro-Bennett. This was a very special evening with many former Doggett’s Coat and Badge Winners supporting the apprentices along with their very proud families and friends to celebrate their achievements. A Toast to Thomas Doggett. His wager keeps the watermen fit.